My awesome friend Sara opened up her etsy shop Simple Serendipity a few months back & it has just taken off! She makes really cute earrings & each pair is priced at $5.00 or less! She has been generous enough to offer one Sparkle Power reader a $25 gift certificate to her shop!! To be entered into the giveaway, please leave one comment on this post telling me your favorite pair of earrings from the Simple Serendipity shop. Be sure to leave your e-mail address so that I can easily get in contact with the winner. This giveaway will run through Friday, June 4th. Good Luck! Great store! The Simple Groovy Black earings are my favorite. Thanks for the great giveaway! super cute earrings! i love the simple swirls and the simple purple mum earrings. i just might have to get some myself! adorable. i love the simple blue mums! simple white mum is so awesome, i wish I were a dangling earring girl, they're all CUTE! do love the lime green mums, so retro. Her shop looks so cute! ooh, the lime green mums or unique yellows...lovely shop! Lots to love in that shop, including the prices. I love the jasper bracelet and the yellow crackle earrings. I am loving the simple yellow suns- seriously cute- and insane prices!!! OH wow - I LOVE her earrings and LOVE the prices! I am actually thinking of purchasing her mum earrings for my bridesmaids! ANYhow, for myself I would choose the dainty brown fabric earrings or the jasper pendant or the indian summer earrings... I just love it all! I really like the simple crack me up earings! Great shop, thank you! The green mums for sure. Such cute stuff and the prices are crazy!! I love the Mum studs. Great earrings... I love the Simple Tiny Turquoise... so pretty.. Thanks for a chance to win. I would have to get my girls some goodies.. So hard to pick just 1 favorite. I'm really feeling the green mums though. I really liked the simple crack me up Orange ones. She has some really great jewelry for great prices! love the simple fabric flower earings! wow everything is such an amazing price!!!! I love the simple dew drops. The brown mums, tropical beach, and simple melon are all great too! thanks!! I love simeple tropical beach with simple green blossom in a darn close second. Cute and GREAT prices over there. I will for sure be checking out that store again--thanks for the heads up!! The simple dainty brown earrings are so pretty! They'd look great on my first day of my new job in two weeks! oooh... love the shop! I love the mums, especially the green ones. I absolutely love the simple green blossom earings. Makes me wish it was spring here. I love the strawberries and cream. I will definitely bookmark her shop, the prices are awesome and everything is pretty! Any of the simple crack me ups are great! They are all really beautiful. lovely earrings - my favourite ones are the tiny little turquoise ones, pretty and dainty. Hello, I'm new to your blog. I found it from amother blog because of the adorable ruffle sleeve top. How great that the tutorial is done for the exact size my Granddaughter is wearing right now. Thanks so much. Your friend is going to do very well with her jewelry I think. Her prices are great. I just hope she's not pricing herself too low. I really loved quite a few of her earrings but my favorite was the Simple Green Blossom earrings. I really love the silver part and the way she's designed that. Wonderful! Thanks again for that adorable top tutorial. My favorite pair are the Simple Sparkle. I love the Simple Marshmallow earrings! I'm pretty sure I could wear any of these earrings hapily! But my favourites are the Simple Crack Me Up in Yellow. What really cute earrings!! I think the Simple Marie, Simple Green Blossom and the Simple Tiny Turquoise are my favorites (yes, I'm no good at picking just one). I absolutely adore Simple Sparkle, delicate and so very pretty! Thanks for the giveaway. The simple dew drops are my favorite - so lovely! my favorites are the simple strips earrings! I love the lime green mum earrings, they are adorable! I like the Simple Stripe earrings and the Simple Yellow Sunshine. Cute shop! Cute store - My favorite is the Simple Strawberries and Cream! I like the 'Simple Blue Ice' earrings. The colors are gorgeous! Thank you! Wow Sara- thank you for your generosity! My favorite pair of earrings from your shop are the Simple Tiny Turquoise earrings! I like the Simple Green Blossom earrings. I like the simple fancy me earrings . Congrats to her on her new store and success . I love the ruby square and the lemon drops, and of course all of the mums. I love her shop!! The simple green blossom earrings have such a lovely pop of colour. I like the Simple Sparkle, pretty and simple. I'd love to snap up the simple jasper band! My favorite is the simple white mum! Hope i win!! Not easy to choose, but I just spent about 5 minutes looking and I have to say, I think tropical beach is my favorite! Perfect for summer! Nice & cheery. So many lovely earrings! ^^ My favorite is the Simple Swirl. so cute! I love the Simple Red Rock earrings. I love the Simple Lantern Blue earrings! Oh! I love the "simply tropical beach" earings. Tres cute! Great find! the simple green blossom are so pretty and so are all the rest. was not so easy to choose! I'm a huge fan of the Simple Lime Green Mum... or really any of the Mum earrings! Thanks for fabulous giveaway!! Loved the Red Rock earrings!!! Love the Simple Blue Ice! Cute shop and awesome prices. Thanks for the chance! Love the Simple Dainty Green earrings! Simple Swirl are my favorites! i love all of her stuff. it makes me want to wear earrings. and all the prices are reasonable. I am in love with all of the mums, but the simple dainty greens completely won me over. I am SO crossing my fingers!!! The simple mums are just darling! I can't make up my mind on a color, though. Surprise me! I love the shop ! I really like them all, but if I have to choose, I would pick the lime mums or flower too earrings. they're so nice !! I like Simple Light Blue Ice. I love Simple Stripe earrings. Thanks for the giveaway. cindyhinckley at msn. My favorite is the Simple Stripe earrings! Fun earrings! My favorite are the Simple Crack Me Up (yellow). I dont know how you can narrow it down to just one...one of my favs is Simple Yellow Sunshine! I love the Simple Boxy Pink Bracelet. I love the simple mums in just about every color. They are awesome. I love the Simple Lemon Square earrings. And everything else. Great shop! Everything in this shop was beautiful, but I think I like the Lime Green Mum earrings best. Okay, lets be honest-I love the Mum earrings in all the colors! I love the Simple Strawberries and Cream earrings! Great store and great prices! I like the Simple Stained Glass earrings. LOVE the simple stained glass earrings! Simple Stained Glass is my fave! 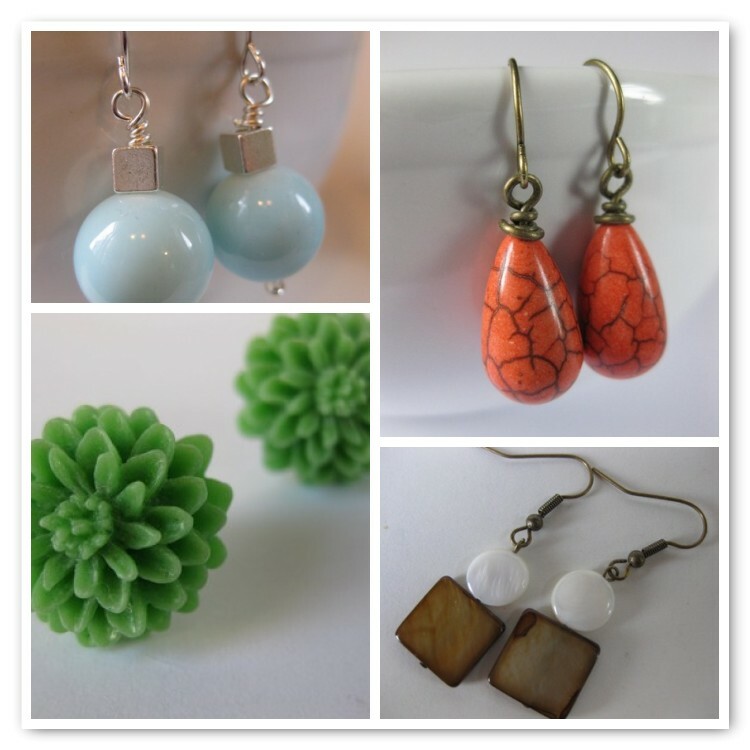 My favorite is the Simple Green Mum earrings. All the jewelry is cute, and what a great price! I've bookmarked your site on my computer. I love the simple white mum earrings - beautiful! They are all so pretty! I really like the simple tropical beach! My faves are the Simple Crack Me Up in Lime! And Amazing Prices! I like the Simple Indian Summer. Thanks for this beautiful giveaway. I really like the Simple Lemon Square earrings are so cute! I like the Simple Marie earring the best! My favorite pair is the Simple Dew Drops (Red) earrings! My first pick would be the Simple Lime Green Mum...followed by all the rest. hehehehe... Praying tonight that I will win! I love the Simple Brown Mum earrings! Everything is so cute and affordable! I'm loving the Simple Red Rock earrings. Great giveaway! I love, love, love them all! But am particularly fond of the simple pearly girl and simple lemon box! I love the mums, but really all of them. I could get into some trouble there! I love the lime green mum! I love the simple blue ice earrings! I love the Simple Marshmellow earrings! They are so stinkin' cute! Thanks for the giveaway!! I hope this isn't too late. great giveaway! Love, Love the simple tropical beach earrings Yellow & teal are my favorite colors!! Simple Blue Ice. Great store! The Simple Marie in White or Blue or Simple Nature. Absolutely lovely jewelry. So many to choose from. When I see Sara wearing it I always want THAT one. Love the blue ice earrings.